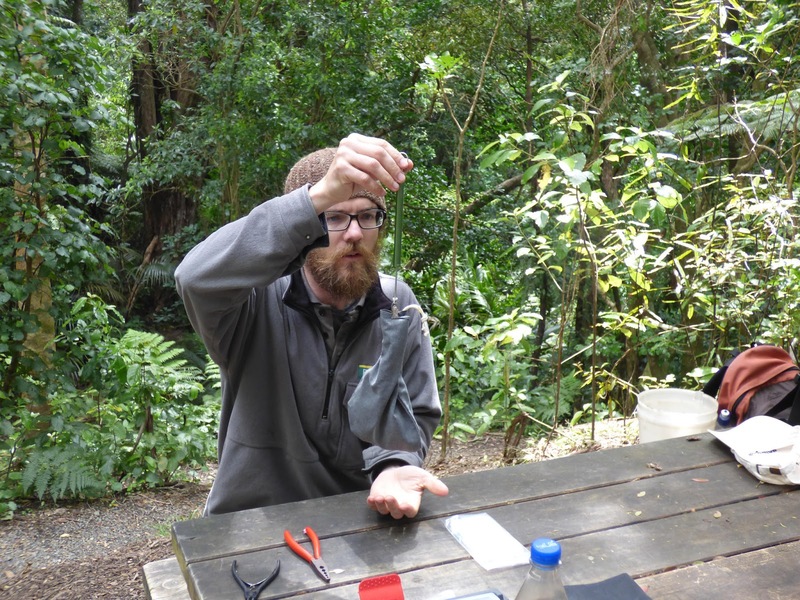 Peter has asked me to post a few entries on the blog about hihi on Kapiti Island throughout the current breeding season. So here is the first one! 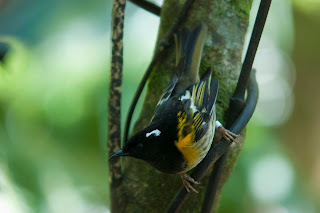 The hihi, or stitchbird (Notiomystis cincta), is an endemic passerine historically found in the North Island and on other surrounding offshore islands. The species declined rapidly since the late 1800s mainly due to habitat loss and the spread of introduced predators, and now Hauturu/Little Barrier Island is home to the only naturally occurring population of hihi. 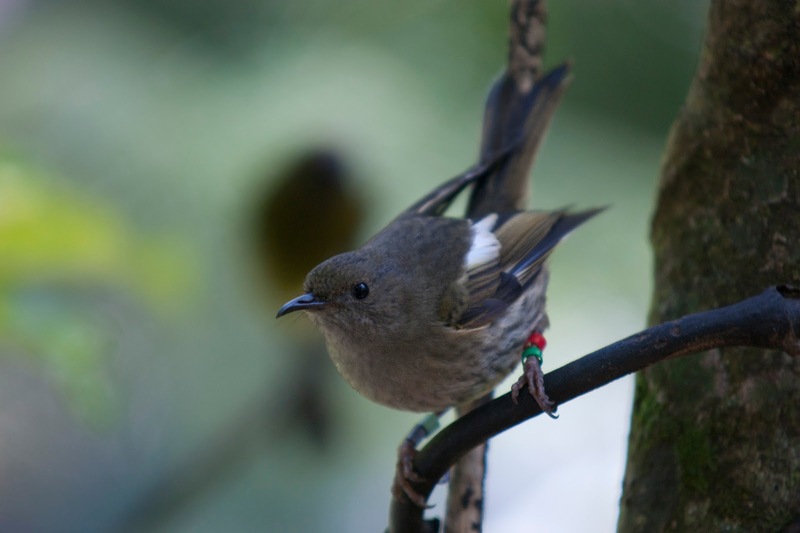 Hihi have since been transferred to several locations around the North Island and populations are now managed at Tiritiri Matangi Island, Maungatautari Ecological Island, Bushy Park, Kapiti Island and Zealandia. Hihi are cavity nesters that feed on nectar, insects and some fruit. 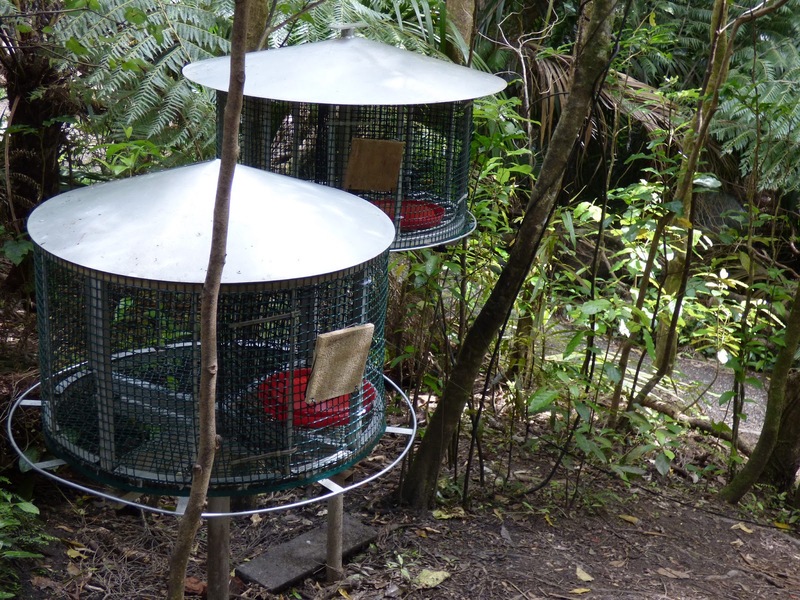 Managed populations rely on supplementary food (usually sugar water) and artificial nest boxes to help improve breeding success at sites where old growth forest is lacking. 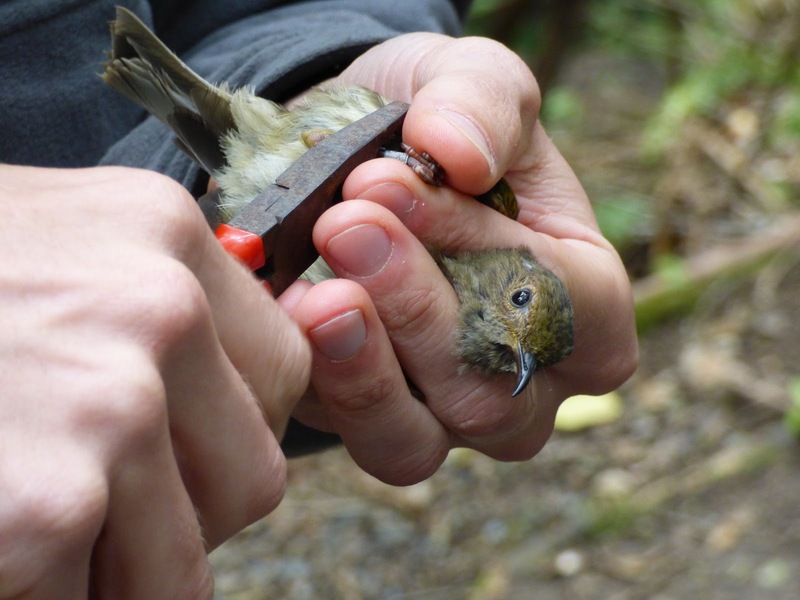 Hihi were first translocated to Kapiti Island in 1983 and their fortunes have fluctuated since then. Subsequent transfers, the removal of possums, kiore and Norway rats, and the implementation of a supplementary feeding system have allowed hihi on Kapiti to slowly increase in numbers. The current hihi population on Kapiti is 108 known birds. 94 of these were identified in the most recent pre-breeding census in October 2015, and 14 unbanded birds have been caught and banded since September 2015 to bring the total known population to 108 individuals. There are still an estimated 5-10 unbanded birds yet to be caught. Birds are caught by modifying the feeding cages and patiently waiting for unbanded birds to take the leap of faith into the cage. A trap door is then pulled by a waiting person and the bird is removed from the feeding cage. Once safely in the hand some key measurements are taken, the hihi is banded and then released. The birds have currently all but abandoned the feeders, indicating that they are nesting and incubating eggs, or perhaps feeding fledglings. Hihi chicks are fed by their parents for around 30 days before they fledge, which is a long time compared to other passerine species (bellbirds take about 14 days to fledge after hatching). We are expecting to see juvenile hihi in mid-January, who we will attempt to catch and band as well. Hihi being weighed. Males are around 35g-40g, females 28g-32g.